A reverse geocache – a box that only opens in a specific geographical area – is a perennial favorite here at Hackaday. We see a ton of different implementations, but most of the time, the builds are reasonably similar. Of course dedicating a GPS receiver solely to a reverse geocache isn’t an inexpensive prospect, so [Eric] came up with a better solution. He’s using a smart phone as the brains of his geocache, allowing him to keep the GPS and display outside the locked box. 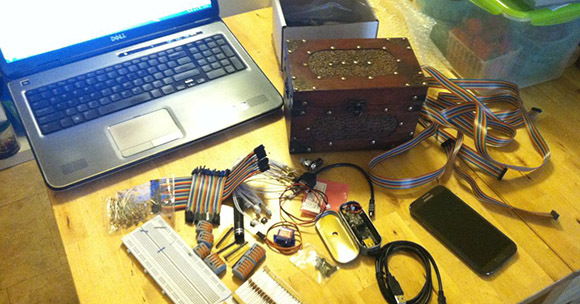 The build began by finding an old box and modifying it so it can be locked with a servo. The only other bits of electronics inside the box are an IOIO board, a battery pack, and an I2C EEPROM for storing a few settings. On the phone side of things, [Eric] wrote an Android app to serve as both the programming interface, UI, and GPS hardware for his reverse geocache. It’s exactly like all the other reverse geocaches we’ve seen, only this time the controls are wireless. [Eric] put up a video demoing his reverse geocache. You can check that out after the break. Very innovative take on the reverse geocache idea. Well done! I have just one suggestion: Calm down! I tend to talk really quickly in real life as well. In this case though, (you can’t really tell) I’m sick so I was trying to finish talking as quickly as possible in order to save my voice and throat from further grief, ahaha. seems pretty calm to me. what are you smoking? Wow, pretty harsh there. What I meant was that he just seemed nervious. I felt like I was back in my communications 101 class listening to first time speeches. I didn’t mean to make offense. This was amazing! Lots of work went into it. Hope you feel better soon. one problem is that if you enable fake locations then you could just use an app to set the location to the destination unless it is doing raw GPS interpretation. It’s still possible to bypass this check with a rooted phone, but I’m not going to worry too much about it. I can also check for installed packages matching those of known location spoofers and refuse to run if any are installed. I finished the hardware and started on the software for an almost identical reverse geocache using a smartphone. I’m using the bluetooth-bee standalone as the internal part – The phone pairs painlessly with the box and sends unlock and lock commands… and I’m using a couple of extra pins to add a few blinky lights and a pager vibrate motor to the box… so it can do a bit of taunting you once it’s paired up.